Ahh, the photo above CRACKS me up. 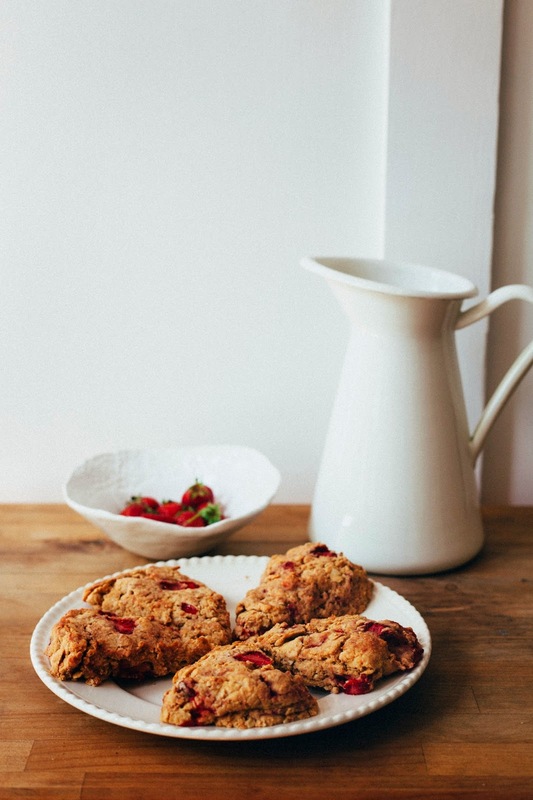 It was taken just after I had put down my camera in frustration, willing to make these strawberry oat scones more photogenic. 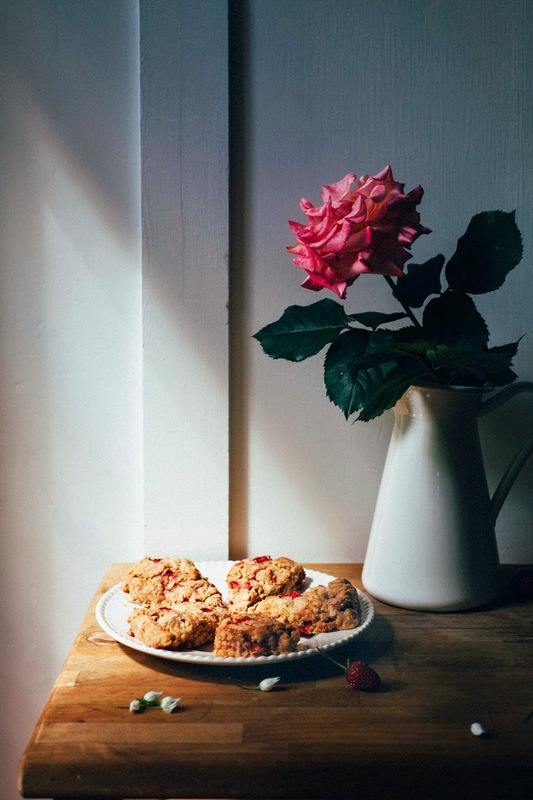 I stepped out of the room to take a break, frustrated by the day's ever-changing light, and when I came back, there it was — a single ray of light from the window was shining upon these strawberry oat scones, as if God himself was giving these pastries his blessing. "Never mind your terrible pictures," the lord commanded. "Eat the damn things, for they are delicious." Or at least, that's what I imagined was the message. Because for the last few years, I was convinced that I didn't actually like scones very much. The scones I'd had were either as dry and hard as a rock, or just too sweet for breakfast. That is, I'm talking about that morning I went to the San Francisco DMV thinking that a scone with my coffee would suffice for breakfast — fast forward to a mere half an hour later, when I was suffering some sort of hangry panic attack from a scone sugar crash, in addition to the knowledge that I still had another 3 hours' worth of waiting in front of me. 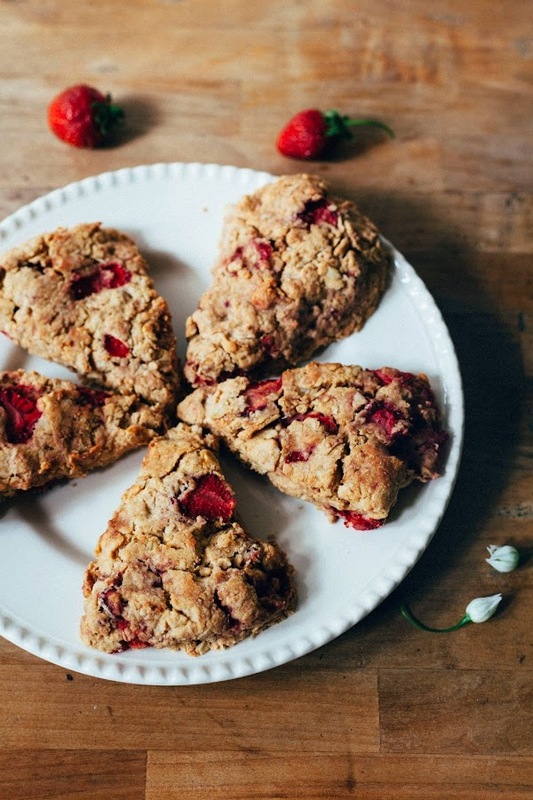 Filled with whole wheat flour and oats, while abstaining from refined sugars (the sugar comes from the fresh strawberries and maple syrup), I found that these scones were perfect. They lacked the cloying sweetness I tended to avoid in the morning, and one scone produced no pre-lunchtime hunger panic attacks (even after a 5-mile bicycle ride to work!). In addition, the scones came together in 20 minutes — this is definitely a recipe I'll be keeping in rotation for the rest of the summer, especially as other fruits come into season. The strawberries work wonderfully with the maple syrup and oats, but I'm already daydreaming of blackberry and blueberry variations. This recipe uses whole wheat pastry flour, which is a bit of a pain to find but you can get it online or in a fancypants grocery store like Whole Foods (where they sell both the King Arthur Flour and Bob's Red Mill varieties). Do not confuse whole wheat pastry flour with whole wheat flour — whole wheat flour is best for bread baking as it contains more gluten, whereas whole wheat pastry flour has less gluten and comes from a softer type of wheat. Maple syrup in the United States comes in two grades: A and B. Grade A maple syrup is thinner and has a lighter flavor. Grade B is thicker with a richer and bolder flavor. Use Grade B maple syrup if you can! It makes a big difference. The dough will seem dry, but that's because it takes some time for whole wheat pastry flour to absorb liquid (due to its higher fiber content). If the 1/2 cup of cream provided in the recipe isn't enough to bring the dough together, feel free to add more cream a tablespoon at a time until you're able to do so. Preheat the oven to 400 (F) and prepare a baking sheet by lining with parchment paper. In a small bowl, combine 1/2 cup cold heavy cream and 1/4 cup maple syrup. Whisk together and set aside. In a large bowl, combine 1 3/4 cups whole wheat pastry flour, 1/3 cup rolled oats, 1 tablespoon baking powder, 1/2 teaspoon salt and 1/4 teaspoon ground nutmeg. Whisk together until combined, before using a pastry cutter to cut 6 tablespoons cubed unsalted butter into the flour mixture until it resembles coarse, pea-sized crumbs. Gently fold in 1 cup chopped fresh strawberries, before using a fork to stir the wet ingredients (from the 2nd step) into the mixture. Transfer the dough to a lightly floured work surface and knead briefly, just until the dough comes together. If the dough is too dry and is having difficulty keeping its shape, add 1 or 2 tablespoons of cream until it holds together. Pat the dough into an 8-inch circle and cut into 8 wedges. Transfer the wedges onto the prepared baking sheet and bake in the preheated oven for 18 minutes, or until golden and slightly firm to the touch. Transfer the scones to cool on a wire rack for at least 10 minutes until eating. The scones will be best on the day they are made, but will keep for up to 2 days in an airtight container. Baha okay so the first thing I thought when I saw that photo was "is this real life? THEY'RE SO BEAUTIFUL" and then after glimpsing your first paragraph I was like "oh no she thinks these photos aren't up to par...awk." But no. I'm glad we agree that that photo is a thing o' beauty. I, too, used to hate scones until I saw the light (and so did my hips...), but yes, most of them totally cause sugar crashes for me too. (Especially giant, delicious scones from Tartine, ahem.) These look so fantastic!! Loving the pictures. I have actually made scones before so this is a recipe I might be able to try! Thanks for sharing. These are gorgeous! Totally worthy of a God-spotlight. Bizarrely, I usually find that I get hungrier faster when I do eat breakfast than when I don't, so I find these extra appealing. I love that you gave them more staying power -- but that they still look so delicious! Before I even read this, I saw that picture and thought, daaaaang that photo is the definition of beauty. That first photo is perfection. So, so pretty. And these scones look perfect, too! I love the oat, strawberry combination. I will have to try them soon. I did exactly the same as Molly - I spent about five minutes just staring at the first picture - isn't it funny how sometimes those perfect photos just appear to us, normally when you're least expecting it! I'm a big scone girl over here so these? Must make! 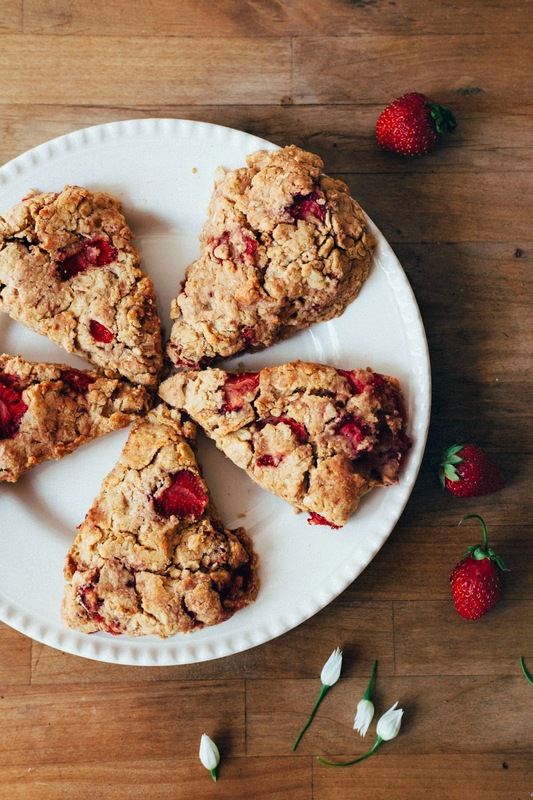 I love scones and I will have to try this healthier variation. I echo everyones' sentiments about the gorgeous first picture!! Oh my goodness, I saw them instagram and just had to forage for the recipe. The crumb looks beautiful!! yes, a scone convert! they are so delicious. especially studded with strawberries with just a touch maple. ps - how's your kitchen going?!? i can't wait to see when it's done! Looks fantastic! I imagine the cream makes such a wonderful touch. I've been burned by dry, bland scones before - excited to give this recipe a shot!